In further poetry news... R.V. Bailey, co-editor of aforementioned Book of Love and Loss, was also the judge for this year's Torbay Open Poetry Competition. 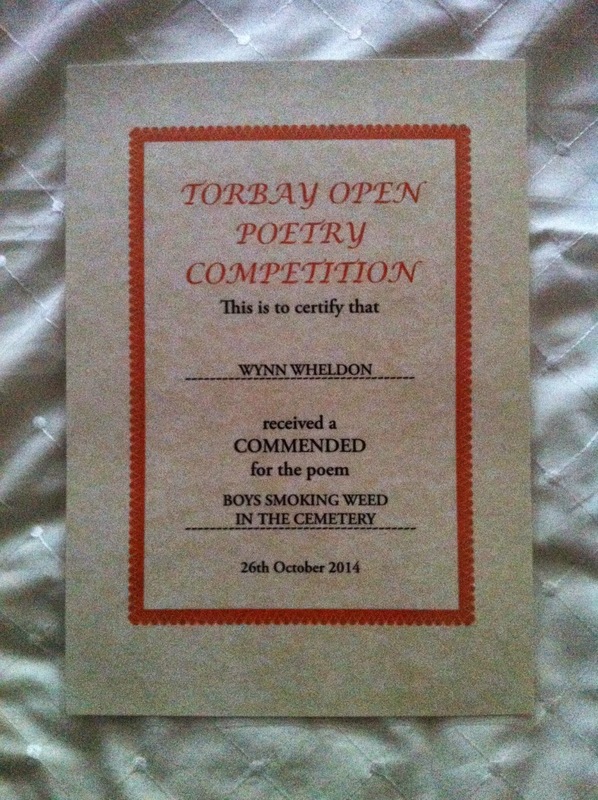 She went so far as to commend a poem I had entered, and I went to Torquay on the weekend to collect my certificate during the course of the Torbay Festival of Poetry. At a grand supper on Saturday night we listed to Maurice Riordan reciting. One of the poems he read was 'Sweet Afton'. I shall give you the first verse. Once we sparked up on planes, playgrounds. Chance at the wheel to catch the light in one move. The last time I won anything for poetry was in 1974, when I won the Milton prize at school. Sounds very impressive, but the truth is my poem was the only entry. Here's a picture of my certificate. The poem is called 'Boys Smoking Weed in the Cemetery', and as soon as I hear that I may I shall post it here for the bigger world's delectation.